Ok, so Week 2 of the 12 Week Year did not go so well. I guess I’ll let the numbers speak for themselves. 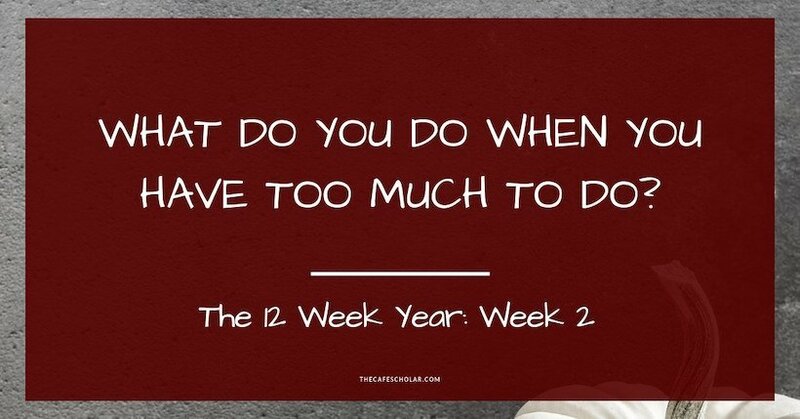 I’ll talk about that…and what you do when you realize you have too much to do in a week (or a day). 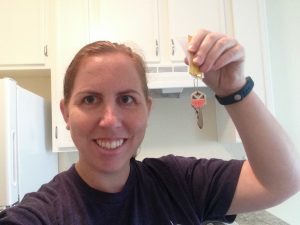 But first, this post is part of a series as I go through the 12 Week Year to reach two goals for my business. I’m working towards a (tiny) income goal and a (tiny) book sales goal for this first 12 weeks. If you missed week 0 and week 1, go check them out and then come back here! *Note, I actually did bring in some revenue during this period, but Amazon paid my old bank account, and so I had to transfer it over. So I’ll count it when it actually hits my Profit First bank accounts. Part of your plan has to include the other stuff that’s going on in your life. That’s especially true for me since I’m working the 12 Week Year for this side business while working my full-time job, leading a ministry, and more. I had all these tactics on my list for week 2, but I didn’t take into account the fact that I was scheduled to teach a class for two days. That means prep time, commute time, a longer work week…I absolutely love teaching for School of Ministry. It’s my favorite thing. But at the end of a work week + teaching weekend, I was wiped. I had nothing left. Instead of knocking out tactics, I took a break. I read a book that I needed to review anyways. And I slept. And it was okay. What do you do when you realize you have too much to do? 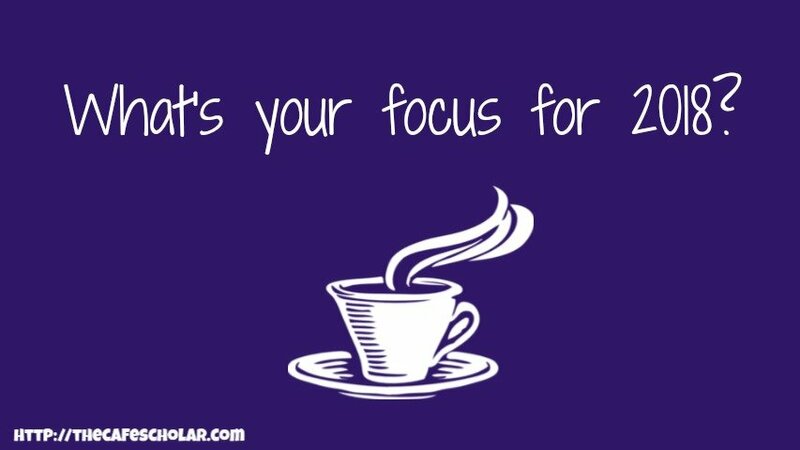 If it’s early in the week, hit PAUSE and rewrite your plan. Seriously. if you can get ahead of things and do this, just…change. the. plan. If you’re already way into it, leave your plan alone. Don’t worry about it. Take a break when you need one. Judge your energy levels, do what you can, go after the low-hanging fruit. For me, that meant knocking out a bunch of the odds and ends tasks off my list because I knew my brain was too toasty for the big ones. And then…this is really important. Do your weekly review. Make your schedule for next week. You’ll obviously need to move some of those missed tasks forward…but don’t try to squeeze it all into next week. Learn the lesson, review your calendar, and only put on your list what you will actually be able to do. Adjust your plan to spread the rest of your tasks out. This is different than just deciding to be lazy for a week. This is the week you realized you planned too much to do. So just learn the lesson – don’t plan so much next week. That’s what the review is for: to figure out what worked and what didn’t. So if your plan didn’t work because you planned more things than you had time for, or if your plan didn’t work because some tasks took longer than you thought, just…do it differently next time. 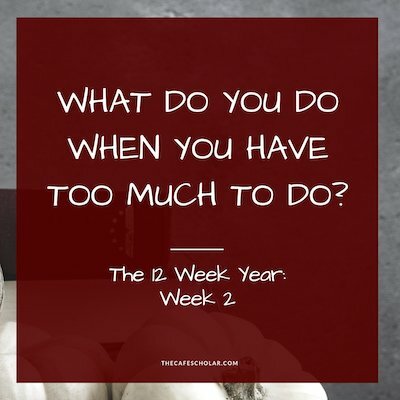 When you make that assessment and change your plan accordingly, the “too much to do” week wasn’t a waste, because you learned something (about yourself, your workload, etc) that will help you succeed going forward. Obviously, I had to reassign the things I missed last week. I did NOT reassign them for week 3. Instead, I spread out the tasks. I also realized that some of my weekly tactics were too large…not too large to get done, but too large for me to bite off in pieces. Since I’m writing a Bible study book, a word count isn’t always the best goal, but instead, I broke the book down into sections and decided to complete a certain number of sections. 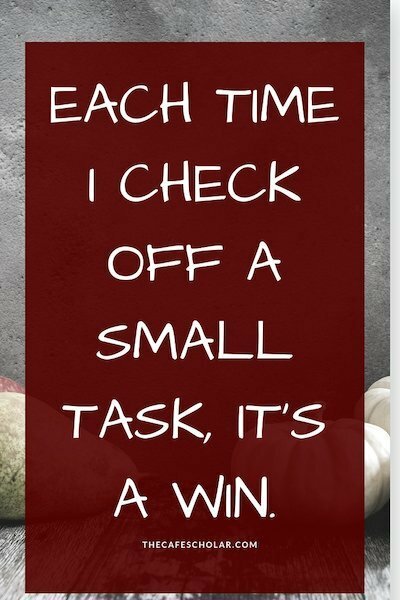 Each time I check off a small task, it’s a win. I’ll check in next week to let you know how week 3 went! This post is a little late, but I promise I did my weekly review on time. I just didn’t write the actual blog post yet. What’s a weekly review? 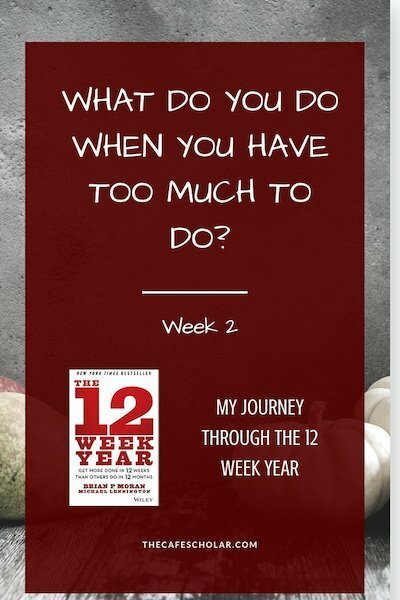 In the context of The 12 Week Year, the weekly review is a meeting you have with yourself. First, you score your previous week: your performance on all of your tactics that you planned out, as well as measuring your lead and lag indicators. 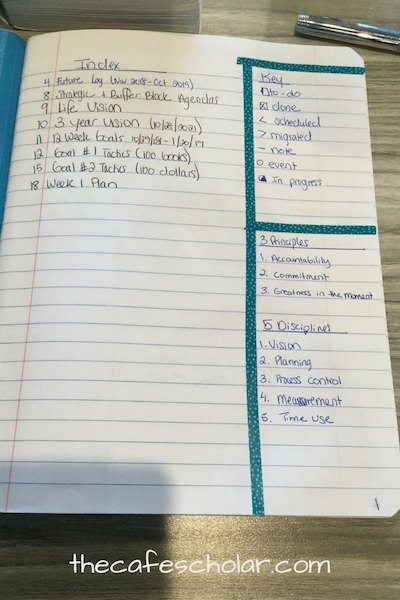 Then, you plan out the next week, schedule out your time including your strategic block, buffer blocks, etc. I need to change how some of my tactics are measured because some really small tasks are weighted the same as a chapter getting done. This week actually went pretty well, BUT I didn’t make progress on two of the most important tactics, so even though I scored 81%, my progress towards the goal is so-so. I’ll adjust this in the plan for next week to force myself to tackle the big things too. I’ll talk about strategic blogs in a bit. But I realized I need to set better boundaries and create better plans for my strategic block so that I can use them to hit those big goals. What is a Strategic Block? 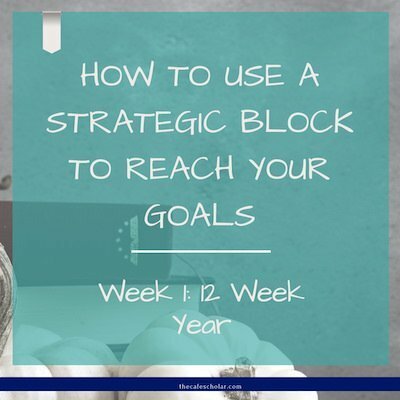 A strategic block is one of the keys to the 12 Week Year plan. These are blocks of time, 3 hours once per week, where you work on your business, not in it. 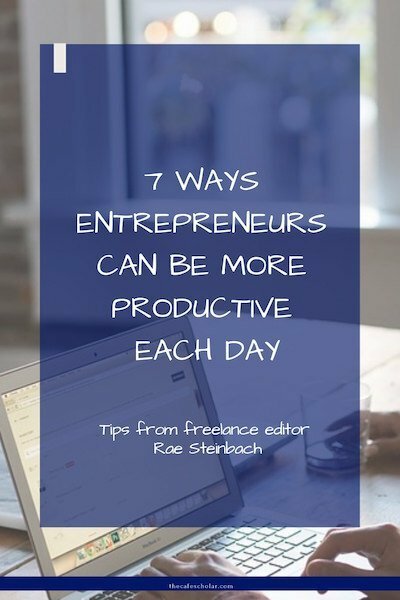 They “should be scheduled early in your week so that if one gets interrupted or canceled, you have time to reschedule it.” We are talking no interruptions, no email, turn off the phone, distraction-free time. 12 Week Review (10-15 minutes): How are your scores? Are you executing at a high level? If not, what needs to change? 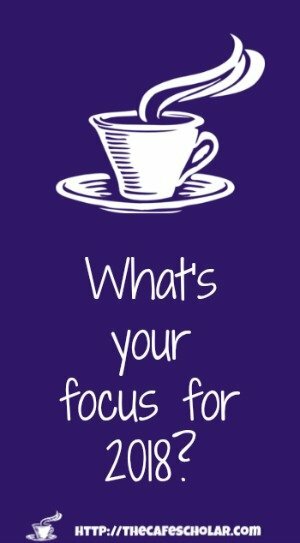 Strategic blocks help create space for the real work to happen, knowing that we can’t work “distraction free” all the time. Knowing that I have that time helps me take care of the minutia, knowing I have space to work on the big goals. After this week, I had to make a few changes to my plan. I had to move two tactics to later weeks that didn’t get done. And I realized I had too much planned for Week 2 because of some other activities going on. Not too many changes this week, though. Before I change the plan I want to see how much progress I make. I’ll check in next week (or probably tomorrow, since I’m a little behind on these updates!) to let you know how week 2 went! 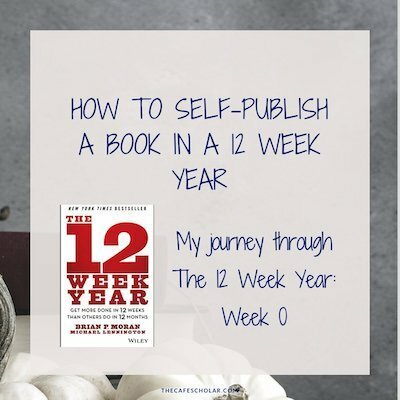 Last year, a blogger friend introduced me to a book called The 12 Week Year: Get More Done in 12 Weeks Than Others Do in 12 Months. The idea was fascinating. I think I read the whole book on a flight back from Germany for a business trip. Took all sorts of notes. Stepped back into life and…promptly forgot about it. 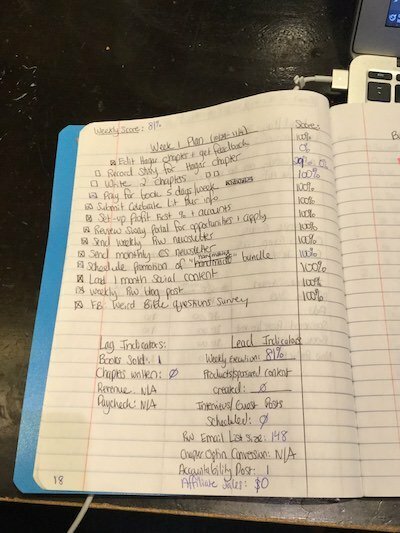 Then a few weeks ago, the gals on the Wit + Wisdom podcast were talking about getting their Powersheets for the new year, and I started thinking about getting on a goal-setting program again. See, I don’t really need a “planner;” I’m happy using iCal/Google Calendar for my appointments and CoSchedule for my editorial calendar. And I tend to not use planners because I want a little more flexibility. 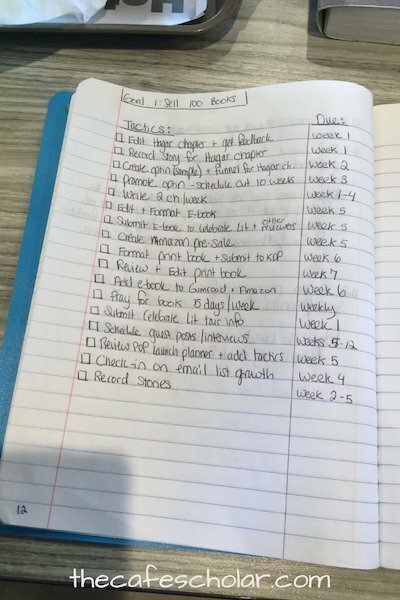 But I knew I needed to make a plan to make consistent progress towards my goals, even if it wasn’t a traditional planner. I’ve been working on my first book for a while now, by which I mean I keep getting distracted by other things. I’ve committed to some deadlines for promotion, though, so I need to get this baby finished! 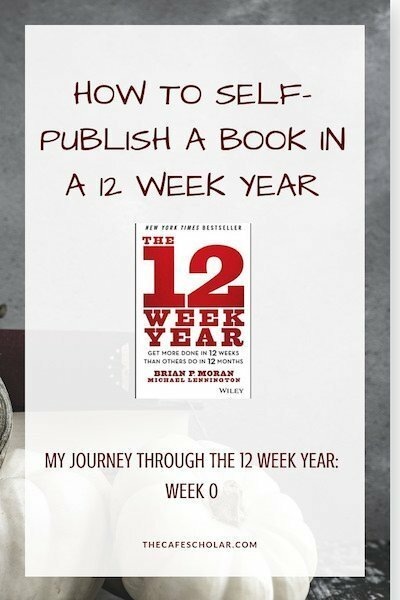 Enter The 12 Week Year. I picked up the book (Ok, my Kindle), did a quick refresh, and was reminded why I got so excited about this in the first place. I immediately made plans to implement this program both at my day job and here in my writing/speaking business. One of the components of the 12 Week Year program is the WAM – the Weekly Accountabilty meeting with a partner or a group. That’s where you all come in. I’m going to be sharing my progress each week so I can get some accountabilty and so you can have a taste of whether this program will work for you. There are a few things that draw me to this plan. First, the idea of a relatively short-term goal gets me excited to finish. I’m also glad for the flexibility to easily reevaluate in 12 weeks to decide my next round of goals. If you’re currently in school, you could easily modify this to a 10-week quarter or a 15-week semester. And…ok, this is a big deal. You don’t have to go out and buy anything major. No fancy planner…technically you could even get the book at the library, but at $11.99 for the eBook, it’s an easy investment to make. Or, like me, you might already have it. 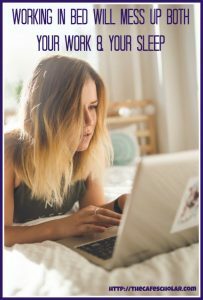 There is an optional workbook you can buy (I didn’t) and an online software option, but you can do all of this with the book and a place to keep track of your goals and your progress. Yeah, you have to start with a week zero. Why? The set-up is going to take some forethought. I spent a Sunday afternoon at Starbucks dreaming and goal planning and getting all set up for the week. When I did this at my day job, I split it over the course of a few days. 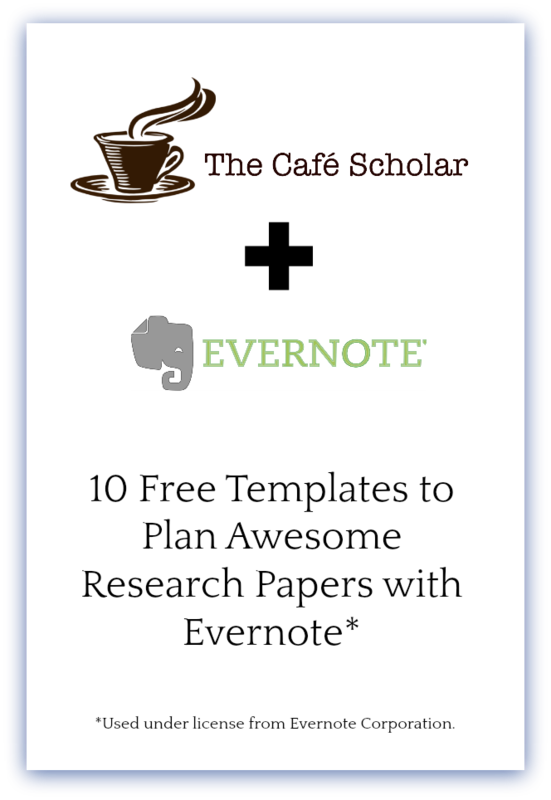 You might use a spreadsheet or Word document. 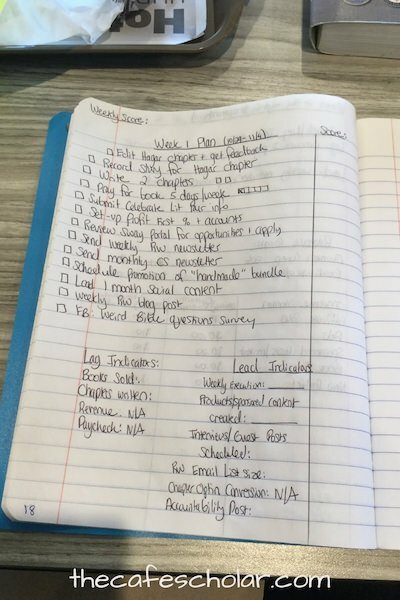 At my day job, I’m using a free downloadable 12 week goal planner from The Goal Chaser. For my writing/speaking business, I’m using a composition book that I have set up in a bullet-journal-influenced-way. Ya’ll, I’m pretty techy, but there is a satisfaction in crossing things off a list. So I started off by creating an index (Table of Contents) in my notebook and numbering the first 20 pages. The 12 Week Year has you start with your vision. First, you dream up (and write down) your big “aspirational” vision. What do you want your life to look like? Then, get a little more specific: what do you want it to look like 3 years from today? This should include professional and personal elements; even (or especially) the personal bits will affect the goals you set. Next, the book will walk you through choosing 2-3 12 week goals. You want to choose goals that will contribute towards getting you to that 3 year dream. You also (generally) want them to be measurable. By nature of 12 weeks they are time-bound, so make sure it is something that you can stretch to do in 12 weeks. 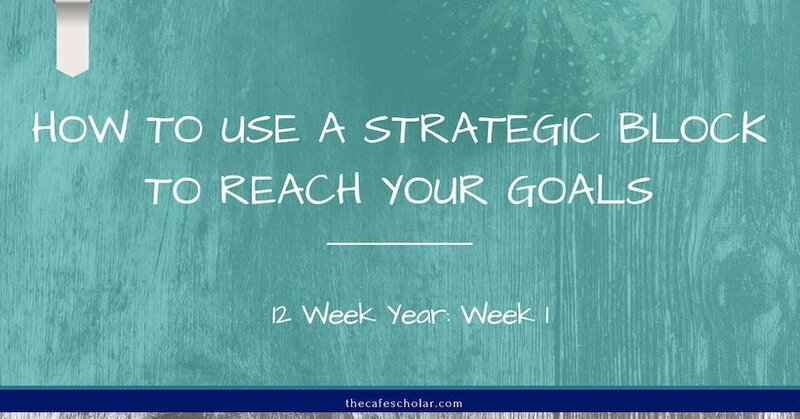 If your goal is too big for that time frame, choose a sub-goal that can be done in the 12 weeks, and that will keep you moving forward. #1 Self-Publish my Bible study book with 100 copies sold. I didn’t say “write the book in 12 weeks” only because I need to finish it sooner than that to meet some of the commitments I’ve already made, and because I’ve already done a chunk of it. And I definitely want to sell more than 100 copies, but since my book’s Celebrate Lit tour doesn’t start until January 15 (week 12), 100 was a good place to start. It’s a stretch goal because of the time, but it should be doable. Right now, this business costs money, it doesn’t make money. 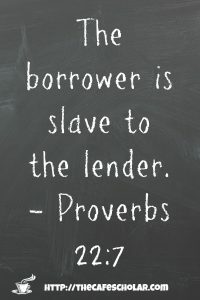 That makes it a hobby, and while I’m trying to get out of debt, I can’t afford hobbies that cost me money. That will start to change when I start actually selling things (like a book! ), but I want to intentionally build on the revenue that is already coming in to get things in the + column. 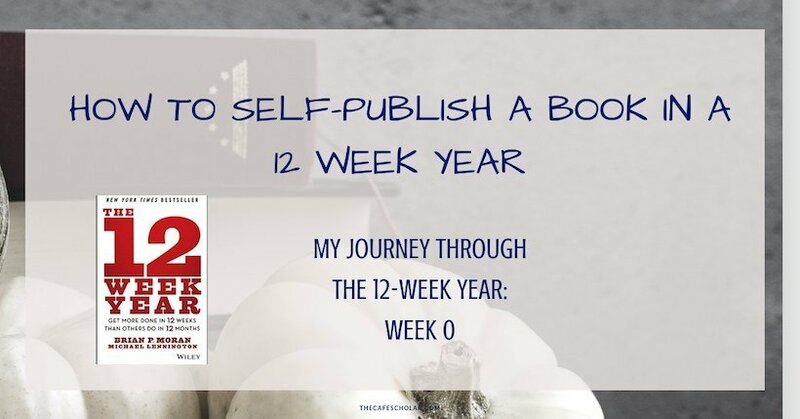 After the 12 weeks, I plan to earn much more than $100/month, but I wanted to choose a goal that gets me profitable but still leaves enough time to finish said book and get it prepared to really promote. Review the Ultimate Bundles schedule for affiliate opportunities that would be a good fit for my audience. (of course, getting the book published will contribute towards this goal as well). Next, I had to choose how to measure my progress. The 12 Week Year talks about two types of measurements: lead indicators and lag indicators. Lag indicators are the end results. So your actual goal would be a lag indicator, but so would a measurement that shows progress towards that goal. For instance, if your goal was to lose 10 pounds, then pounds lost would be one of your lag indicators. They are called “lag” indicators because the results often lag behind the actual activity you’re doing. You can exercise today, but you won’t see the weight loss today. Lead indicators are things that happen early in the process, that contribute towards those end goals. Executing on your tactics would be one of the main lead indicators (and folks that get 85% of their tactics usually hit their goals). To use the weight loss example again, a lead indicator might be calories eaten or minutes exercised. Finally, it’s time to create your week 1 plan. I did this on a new notebook page: I created a list of all the tactics that were marked for week 1. I included checkboxes to show steps that were completed, and a percentage column so that I can give myself a score. 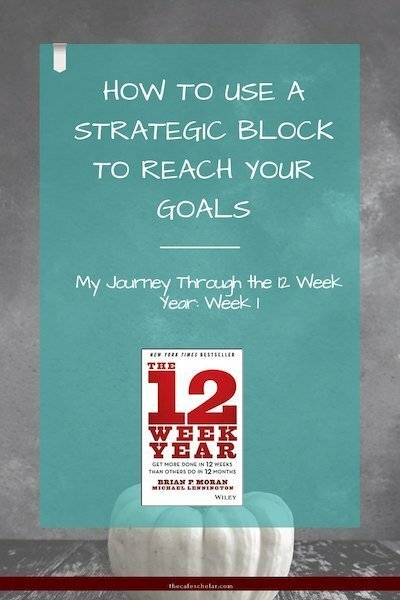 The 12 Week Year also recommends planning an ideal week schedule with strategic blocks and “buffer” blocks to help create space to work towards your goals rather than just getting caught up in the day-to-day. I’ll talk about those next week. I’ll be back next week to share my results of this first week! In the meantime, jump in the comments below and let me know what goals you want to accomplish in the next 12 weeks! Even the most avid cafe scholar needs to work at home or out of an office sometimes. The way you set up your desk can have a big impact on how much you accomplish and the quality of your work. You don’t always have a lot of space to work with, so how can you organize your desk to maximize productivity? 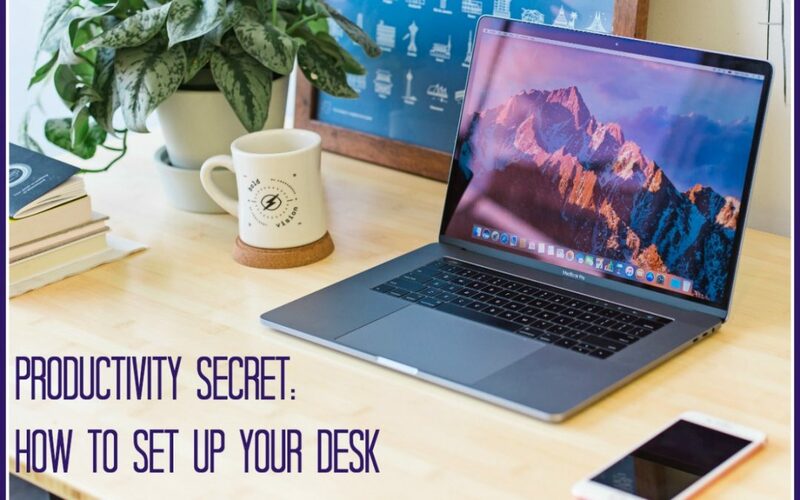 Why Does it Matter How You Set up Your Desk? 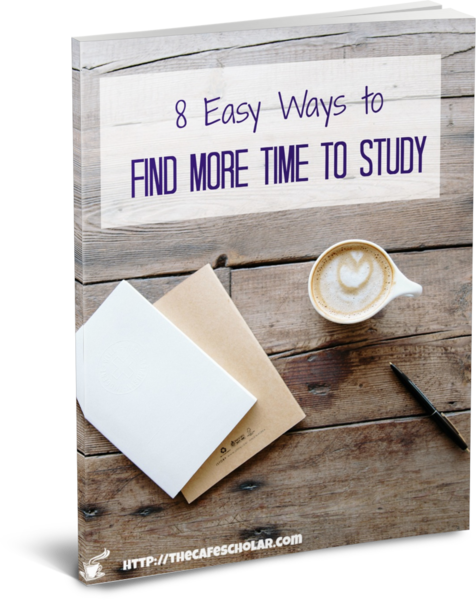 I don’t know about you, but I’m all about studying smarter: making better use of both my time and my other resources so that I can do my very best in school and in the rest of life. 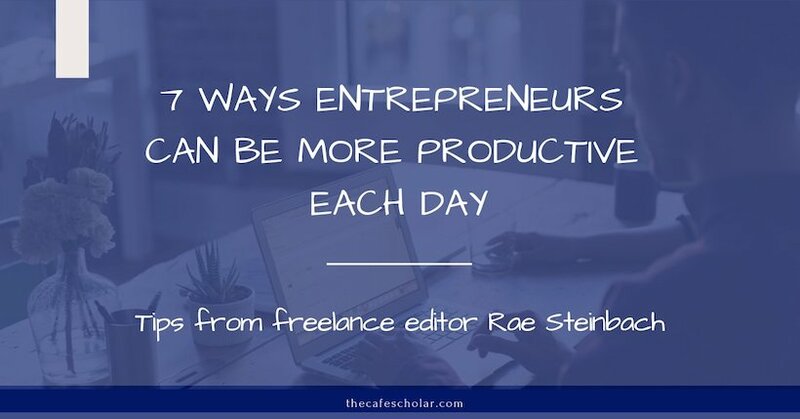 Time is at a premium, and having my space set up with a good system that works for me will help me to waste less time and be more productive. It’s that simple. The good news is, it doesn’t have to cost you much in the way of time or money (unless you want it to!). Organizing your desk can actually be a lot of fun. For me. And my label maker. And a tall glass of iced tea. And TobyMac cranked up on the iPod. Here are some basic principles to set up your desk in a way that works for you and your budget. You may have to tweak things along the way as you test it out and see what works. This is why cafes are such a great place to get things done: they are not covered in stuff, except what you are actually using to do your work! 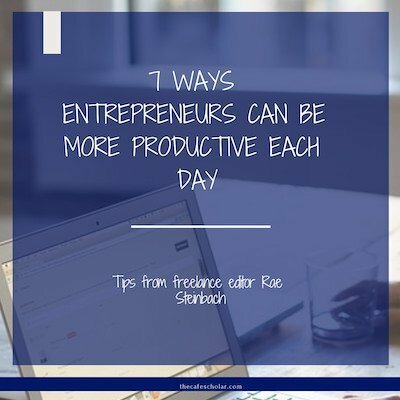 When you set up your desk, you want to have as much of your desktop clear as possible so that you can use this space for what you are actively working on. The only things that really should be out on the surface are the things that you use every day. 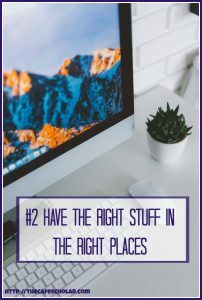 For me, those include a small pencil box with a sharpie, a whiteboard marker, a few black or blue pens, and a pencil or two, and my computer monitor and laptop stand. I also have an inbox and outbox, off to the side and away from my main workspace. You also want your space to be well lit. Try to position it in a place with good natural lighting from a window, or with a light above. Check for glare on your computer, too. You may want to add a lamp for detailed work that requires more lighting, especially depending on what kind of work you are doing. Some people work best with a clean, clutter-and-distraction free desktop; others are inspired to creativity by a little visual clutter. If you fall into the second category, you still need a clean space to work with. One great way to let your creative side show but still have a good workspace is to use pictures, notes, letters, or whatever else catches your fancy to decorate your desk, then cover it with a glass table topper. You now have a desk that is both cluttered and clean! I should add here that if your desk is for work, your bed is NOT for work. Working in bed will mess up both your work and your sleep. If you need a change of position or scenery, go to the kitchen, the library, or your friendly neighborhood Starbucks…but not your bed. As I mentioned above, when you organize your desk, you want to have only the items you need daily out on your desk. Other items should be stored according to how often you use them. If you use it fairly often, put it in the desk drawers. Easy to access, but not in the way. Items used more often will go in the top drawers if they fit. Use containers or dividers in your drawers and have a home for everything that you truly need to keep there. Abby Lawson puts a label in the bottom of the organizers in her drawers, so she can put an item back where it belongs after using it. If your desk doesn’t have drawers, get some of these plastic rolling drawers to slide under, or even a mini dresser. Items that you use less often are going to go further away from your workspace. Where you put them will depend on the space you have. These might include extra supplies such as pens or paper to replenish what you use daily, as well as lesser used craft supplies, etc. I keep these in labeled bins on a shelf near my desk. If there are specialty items you only pull out a few times a year, they probably don’t deserve a space in your immediate work area. Put them in bins, label them, and store in a closet where you can still easily find them, but they aren’t taking up valuable real estate at your desk. Still getting together your school supplies for the semester? Don’t forget to take a look at The Ultimate Back-to-College School Supplies List (including a free printable checklist)! 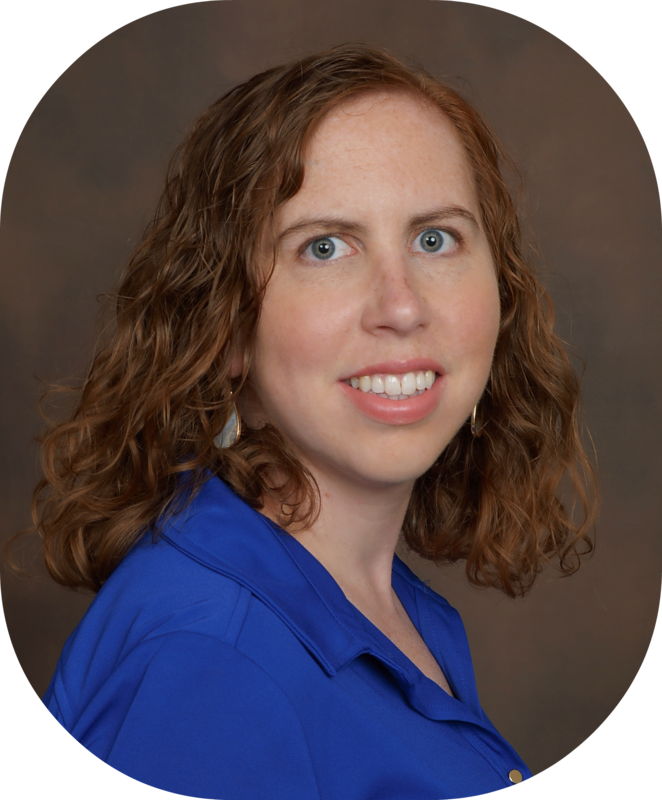 In addition to the items you “use” in your workspace, which Matt Perman calls permanent items, you will also have transient items. These are items that are coming or going, or that you are using for a particular project. Think about what comes in and what comes out. You will want some kind of inbox (I use a shelf storage tote like this one) and an outbox for things like outgoing mail or items that you need to take on an errand. Have a trash can and recycle bin easily accessible right next to your desk, and if you need to shred sensitive documents often, you’ll want either a shredder nearby or a shred bin or even a folder to collect those items. 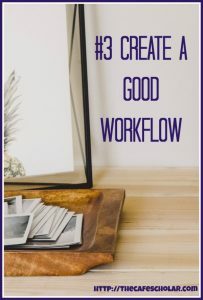 Most of your notes for current projects will probably be in a folder or binder that you keep in your backpack when not working on the project, or will be electronic. If you are finding yourself having a lot of “in progress” tasks with corresponding papers that end up on your desk, use a mail sorter, a step file organizer, one of these hanging wall files to get those off your desk. If your desk has file drawers, use the first section for these “in progress” items. 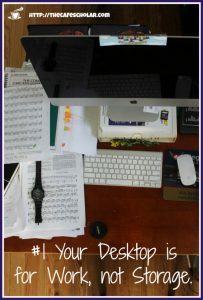 If this post has you inspired to redo your workspace, I highly recommend Matt Perman’s How to Set Up Your Desk. 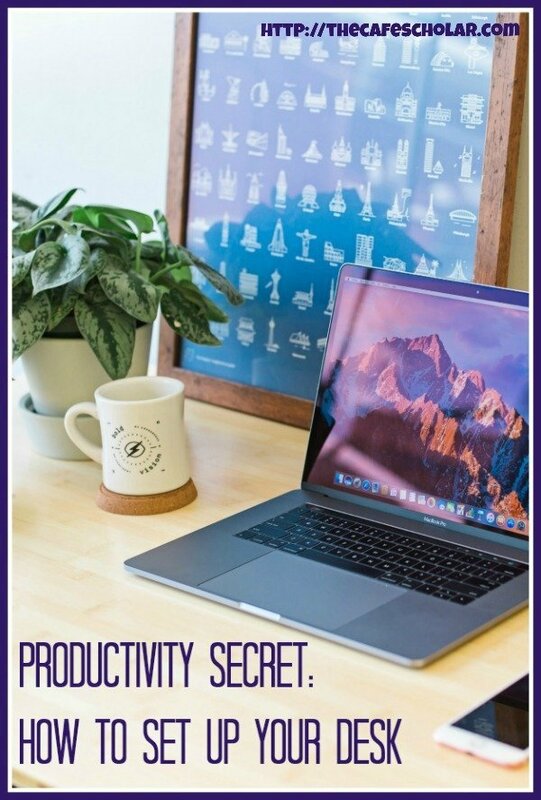 This book is very quick read and it changed the way I use my workspace both at home and at work. Now, passing it off to you: what change will you make to your desk this week to help you study smarter? For even more productivity goodies, check out my post on how creating a nightly routine can boost your productivity.